This entry was posted in Breakfast, Caribbean, Dinner, Fruits, Gluten-free, Healthy, Jamaican and tagged Breakfast, dinner, Food Trends, Fruit, Healthy, Jamaica, Superfood by Janet Davis. Bookmark the permalink. 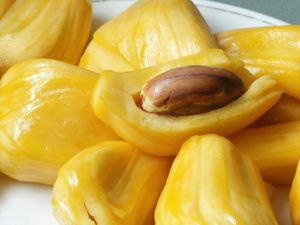 I finally took that trip over to Whole Foods to see if they really had Jackfruit. They did! I think I savored that first bite a solid three minutes. I really miss Jamaica!